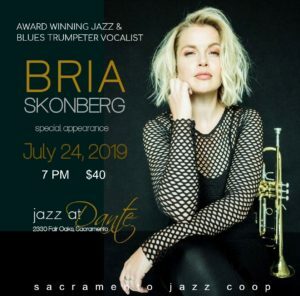 The Sacramento Jazz Coop proudly presents Bria Skonberg in a special performance on Wednesday, July 24, 2019, at the Dante Club. The New York based Canadian singer, trumpeter and songwriter has been described as one of the “most versatile and imposing musicians of her generation” (Wall Street Journal). Recognized as one of 25 for the Future by Downbeat Magazine, Bria Skonberg has been a force in the new generation with her bold horn melodies and smoky vocals, and adventurous concoctions of classic and new. Noted as a millennial “shaking up the jazz world,” (Vanity Fair), Bria has played festivals and stages the world over, including New Orleans Jazz & Heritage Festival, Monterey Jazz Festival, Newport Jazz Festival, Montreal Jazz Festival and over a hundred more. Originally from the small town of Chilliwick, British Columbia, Bria studied jazz and performance at Capilano University in Vancouver while balancing a full road schedule and two bands. After graduating, she traveled extensively, performing in China and Japan and throughout Europe. Seeking new challenges, she moved to New York in 2010. Upon arrival, she went to jam with some friends in Washington Square Park and an hour into playing, world renowned trumpeter Wynton Marsalis stopped to listen, giving her the thumbs up. An avid educator and supporter of public school opportunities, giving numerous workshops and concerts for students of all ages, Bria has been a faculty member at the Sacramento Traditional Jazz Camp from 2008 to present. It is expected that this will be a sold-out show, so get those tickets early.